Last short story of the week. Taking a little break from reality. I will keep writing them and putting them on my Arrested Development page, which I will probably change the name of because I intend to complete them and not leave them unfinished. Actually I have completed everything I have started on that one, so the name is inappropriate anyways. This one is not intended to offend, only to tell a story about a middle aged dreamer named Paul. He opens his closet to possibly the neatest wardrobe that had ever contained clothing. Black t-shirts pressed with deep creases on the short sleeves on one side. Black jeans hanging from the boot openings on the other. On the rack above is a clear Tupperware box filled with stacks and stacks of old concert tickets. On the floor beneath the clothing are 5 identical pairs of boots, each with a different color of shoelace, blue, red, green, yellow, and purple. Paul looks through the closet pointing at different outfit configurations, speaking silently, but focused intently. He starts playing air drums with his fingers as he closes his eyes getting lost in the music playing only in his head. He continues for a moment before smiling and grabbing a pair of black jeans from the closet, a black Skid Row t-shirt, and the pair of boots with the red laces to match the skid row emblem on the shirt. He moves over to the tower of speakers next to his bed and moves the wheel up in a clockwise direction, watching the the bars increase until the volume reaches 75%. The house seems to rumble as he thrashes around in his room, dancing and playing various air instruments with the music. It was 1988. 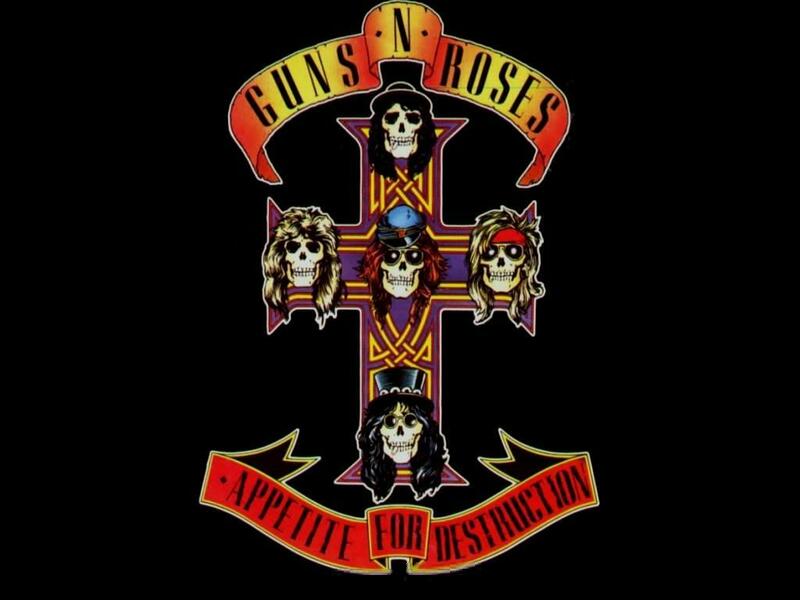 It was one year after "Appetite for Destruction" was released and it changed Paul's life. Paul and his mom and dad sat in the kitchen decorated in late 70's wallpaper. The table was a dark brown oak with a leaf in the middle separating him from his parents. He had made a conscious effort to separate himself from his parents since he heard "Welcome to the Jungle" a few months prior. He would sit on the floor before sitting next to his parents on the huge plush wrap around couch in the living room. His parents knew he was reaching for some independence, so they didn't make too big of a deal about it. This morning they were having eggs, toast, and bacon. Paul sat tapping his fork to the plate, leaving his food untouched. His mom and dad sat staring at him, obviously annoyed. He opened up his eyes and looked back at them. He looked deep into their eyes and just continued to tap the plate. He had a look of fury on his face and was resolved not to compromise. "Paul," his dads says. Nothing, no reaction. "Paul!" Paul gets up suddenly, leaving the table and marching upstairs. He gets to his room and turns the volume knob all the way to 95% and plopped onto his bed, staring at his posters. On the ceiling, he has a new Gun's N Roses poster, with he symbol of the "Appetite" album art. "Welcome to the jungle baby, you're gonna die!" he says at the top of his voice. "Paul? Paulie honey it's time to go." says mom. She grabs the handle of the door, but it won't turn. She knocks gently. It is quiet in his room. The tape ran out hours ago without any remedy to the absence of noise. He must be sleeping. She knocks harder and he bursts out the door. "Let's go! Late! Almost late!" He grabs his mom's sleeve and drags her down the stairs, almost pulling her to the floor. Indeed, it was time, and they were almost late. But for what? Only the most exciting thing to happen to Paul since the tape player was invented. It was Gun's N Roses day in Donington Castle. He had two tickets and had written this date on every calender he came in contact with, even the one on the church office last Sunday. His mom grabbed her purse from the table on their way out the door and climbed into the wooden paneled station wagon parked in front of their house. The entire ride to the concert, Paul told his mom random facts about Guns N Roses, whether she wanted to hear them or not. "Did you know Axl used to teach Sunday School?" He says. "I did not sweety," says mom. "Did you know Izzy is the only band member to graduate high school?" "Did you know Duff has 8 brothers and sisters?" "Did you know Gene Simmons tried to produce the Appetite album? Hmm, good thing he didn't. I hate KISS." The light show was fantastic. The sound was perfect. The pyrotechnics blew his hair back, literally. He stood in the front next to the metal heads and rabble-rousers. He had no interest in their activities. How could they enjoy the show when they were slamming into each other and throwing punches. A couple of girls next to him even passed out. He understood this action perfectly, hoping that he wouldn't do the same. They got removed from the show. He looked up with amazement in his eyes as he watched Axl stand back to back with Slash during the guitar solo on "Mr. Brownstone." Paul was in another world. His mom wanted nothing of the front of the stage, so she awaited him at the general admission area in the back. The crowd was pushing forward. People were drunk and throwing punches. The place was in hysterics. This was the rebellion that Paul was looking for. "Welcome to the jungle baby, you're gonna die! Haha, WE"RE ALL GONNA DIE!" He shouts this over and over as the guitars shred through his ears. Next song up......"Sweet Child O Mine." The riff begins and the place erupted. Fans pushed even harder to the front and Paul found it difficult to keep his footing. "Move it retard!" is shouted in his face by a guy with no shirt on and a bloody nose. The guy pushes him aside and takes his place in front of the stage. More people follow suit, many of them laughing at him and asking what was wrong with his face. "She's got eyes of the bluest skies........." Paul looses his footing and falls to the muddy ground. This opens up a a hole in the crowd and the fans fill it in quickly, stepping on lumps and soft hills that seemed to crack when dug in on. Paul struggled to breath and pick himself up, but the current was too strong and he found himself face down in the mud with feet stepping on the back of his head. Guns N Roses completed their set and the ground cleared as people filed out of the castle. Once the smoke cleared, there was only Paul lying flat in the front and his mom standing anxiously in the back. She recognized his red shoe laces and ran to the front to help him up. It was 6 songs too late. Paul was dead. He was one of three dead at the front of the stage. Sadly, only two were reported and advertised in the media. Despite numerous suggestions by Slash for the crowd to calm down, their rebellion extended even to their heroes.